Scanner easy to set up and great working with our new Xero Accounting system. Great scanner, works straight out of the box. Compact, and clearly faster than my previous model S510. Would recommend it without hesitation. It arrived promptly as stated. I am extremely pleased with this scanner. It is quick, quiet and delivers as promised. Top marks!!! Just sort your folders out beforehand and the scanning is as simple as can be. Love it, very efficient indeed. Using it primarily to scan old photos and it does a great job. I have used this for less than 1,000 scans but it has worked well. I like the fact that it takes up very little space on my desk, especially when shut. The deskewing works well as does the option not to scan blank pages. I would have given it 5 stars but opening the app by right clicking whereas all the others on the task bar require a left click takes getting use to and, more importantly I find the interface that pops up old fashioned and not that intuitive. For example for deskewing you have to click on the options button which is on the scanning tab screen that appears after you have opened Scan button settings. Otherwise a great little machine and would certainly buy again. Great piece of technology, took some technical knowledge to install as we don't have a disk drive on our Mac but up and running now and when coupled with receipt bank saves a lot of time and effort. Delivered as expected the next day. I can only compare with my old Canon scanner but this machine is excellent. I have tried it on custom settings (but like modern digital cameras) it's as good as it comes left on auto. It's fast, auto sensing of colour & it minimised file sizes. Great. Be aware that it lacks drivers. No probs with my FileCentre software but that could be a problem for others. A one button approach to document scanning, the iX500 is equipped with a host of in built functionality and bundled software to make document scanning as effortless and hassle free as possible. Scan batches of mixed documents from business card to A4 through the 50 page ADF without concern for mixed sizes, thickness or quality. A3 size is even possible through the use of a bundled carrier sheet. The ScanSnap iX500 has a number of intuitive automated functions that help minimise both the pre and post processing time around scanning helping to create the perfect scan first time. 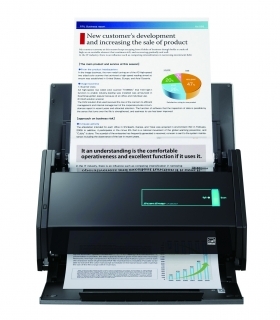 The ScanSnap iX500 can achieve impressive speeds of 25 pages per minute (single or double sided) at up to 600dpi in black and white or up to 300 dpi in colour, the inbuilt GI processor ensures that these speeds are achieved independant of the target device or connectivity. Additionally such a paper feeding performance is enhanced through USB 3.0 support and the use of Brake Rollers which are traditionally the reserve of higher end machines. ScanSnap iX500 is equipped with an ultrasonic sensor that can be turned on to help operators avoid losing images. What’s more, an interactive interface allows users to easily bypass intentional double- feeds such as a taped-receipt on expense report. Are you a fond user of cloud services like Dropbox, Google Drive, Evernote or alike? Then ScanSnap is your instant on-ramp for documents, business cards, receipts and photos. Simply scan and ScanSnap Cloud will identify the type of content and route it to your preferred cloud service. No PC required. Visit http://www.fujitsu.com/uk/microsites/scansnapcloud/europe/ for further information. View, manage, and edit PDF and JPEG files scanned with ScanSnap on a Windows platform. ScanSnap Organizer allows users to convert scanned PDF files into searchable content, embed custom keywords, attach to email or SharePoint, and remain productive with paperwork long after it is scanned. ScanSnap iX500 can quickly and intuitively scan large volumes of business cards, extract the contact information, and place it into editable fields that can then be exported to Excel, Outlook Express, SalesForce and other contact managers. The ScanSnap iX500 is fitted with a newly developed GI processing engine which means that users can now experience wireless operation of their scanner via a compatible Smart Device and the ScanSnap Connect Application downloadable from the Apple App store, Amazon App Store or Google Play. Scan your documents for instant viewing, manipulating and distribution anywhere and anytime. Additionally it is possible to scan wirelessly to your PC or MAC device offering greater flexibility and the ability to place your unit anywhere in your environment. You can now easily scan into your preferred application when no scan interface is available (assuming your Windows application has an import or browse command and supports pdf or jpg), through the import capability. Browse to the new 'ScanSnap Folder' and hit the blue scan button. The documents are now imported into your application and automatically deleted from the ScanSnap folder on your local computer.